After dinner last night, I wanted a little ice cream and I knew I saw a mini Breyers in my freezer earlier in the day. So, I was in luck. We cleaned up the table and I got out a few bowls. I opened up the container and found this. Remains. I asked Bill if he did this and he said yes. 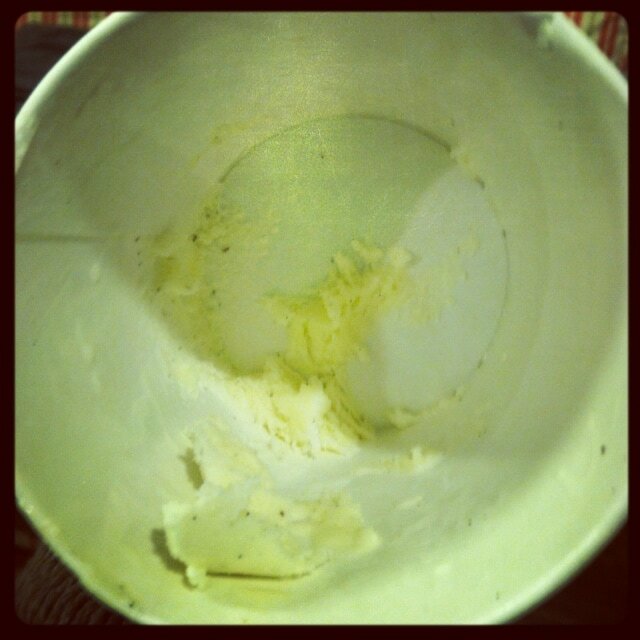 He didn’t want anymore ice cream the last time he had some and figured it was enough to NOT throw away. Is anyone else seeing this?? What am I supposed to do? Brush my teeth with it? LOL! Did you look in the refrigerator and find that bottle of milk with a couple of drops left in it? Wait let me guess…he also leaves the toilet paper roll on the holder with a teeny tiny piece of paper left on it, to avoid changing it. 🙂 Men!!!! Well, if you had a teeny tiny slice of pie….